About a month ago, I decided my craft room needed an overhaul. There was a mound of paper, ribbon, and stamps on top of my work table, and couldn't find my paper cutter. It was so frustrating, and I just couldn't concentrate to create in that space. I needed ORGANIZATION! So, I began the (long) process of sorting through my stuff and finding a place for everything. It was tough…I had to part with a lot of items that I just couldn't find space for (and to be honest, hadn't used in awhile…or ever), but it was totally worth it! 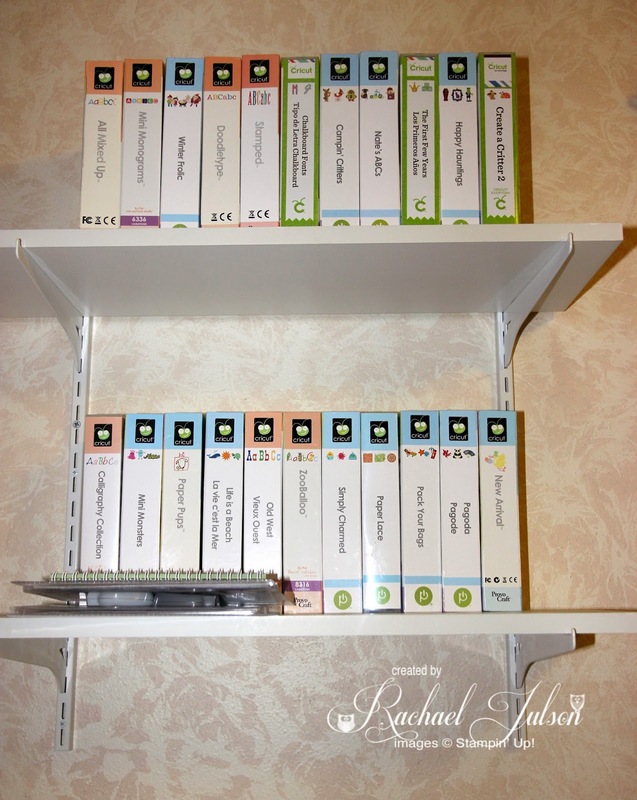 I started by purchasing these two ladder bookshelves, which work perfectly for storing all my stamp sets. I must have found at least 50 finished cards in the mess on my table, and I had a basket laying around that they fit into perfectly! So, I bought 6 more of them, and filled them all! I used to store my punches in an antique sewing box, but it was becoming too heavy, and I was concerned I would ruin it. I put them in the box on the bottom shelf. It has dividers, so I could put them in rows, and I love how I can see them all at once! I had all these great ways to organize and didn't even realize it! I saw this idea for storing my paper scraps online awhile back, and have been using it for a couple years now. I can't imagine doing it any other way. 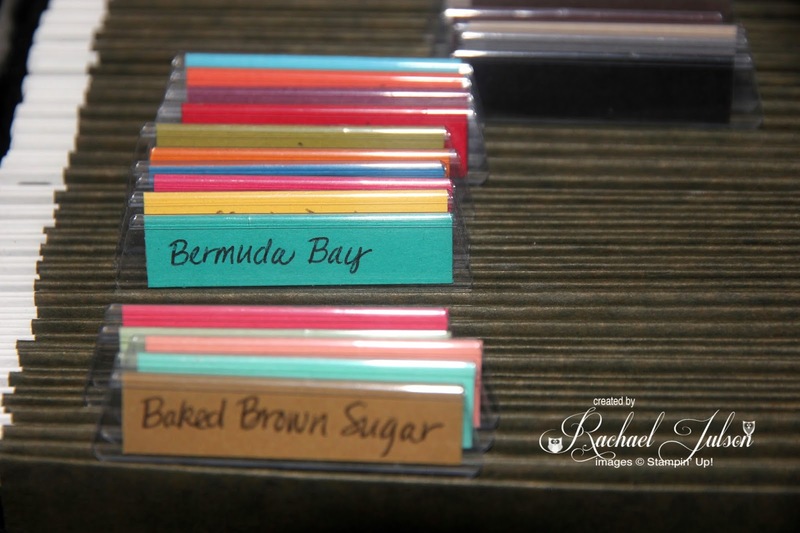 Each color has it's own hanging file and the tabs show exactly what color is in each folder. I keep them all in a rolling cart, so I can move it anywhere in the room. Last year, my husband helped my make this awesome craft table. 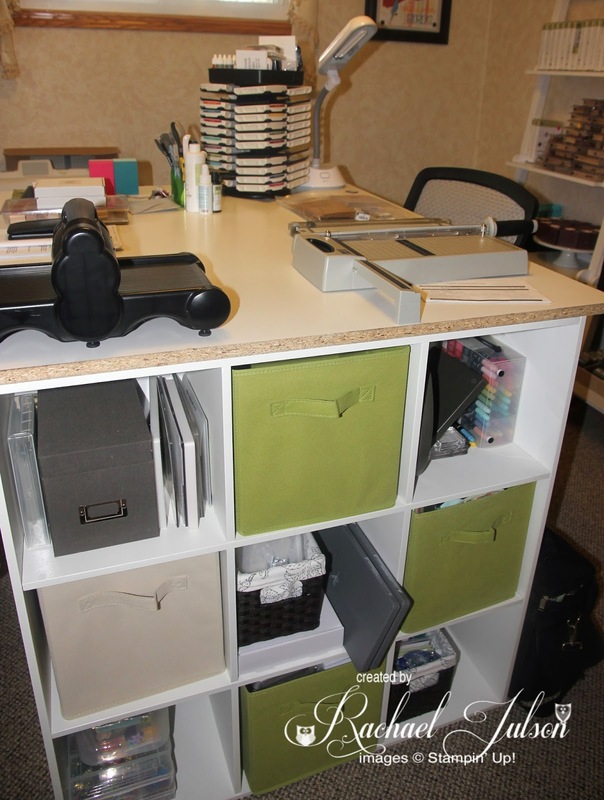 I purchased two of those 9-cube storage units, and added a sheet of melamine to the top. 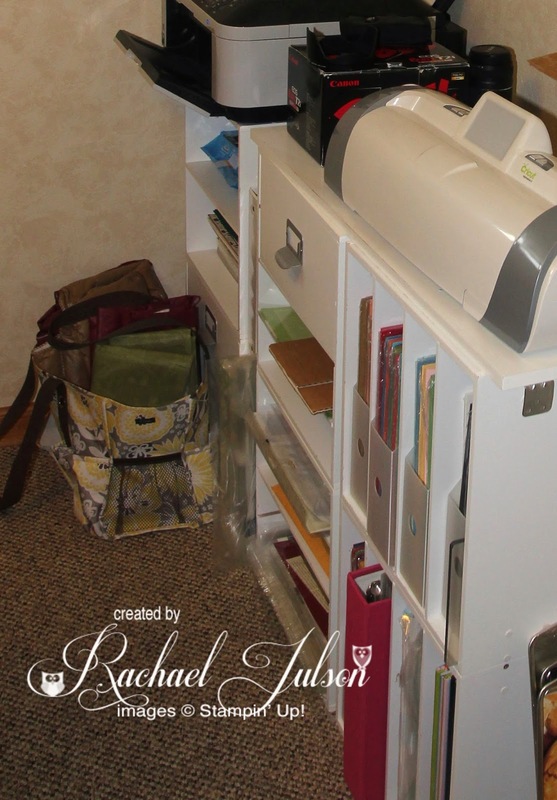 It's great because I use the bins to hold my adhesives, embellishments, and Big Shot dies and folders, as well as retired items that I don't want to part with and my business supplies. To finish off the tour, here's where I keep my card stock (in magazine holders in the vertical slots), Cricut, and printer. I also have some finished scrapbook pages and albums here. I used to keep all my ribbon in the organizer on the wall - it had dowels on the bottom two shelves to hold them. It drove me crazy because when I wanted to a whole roll, it seemed like it was always in the middle, so I had to pull off all the others to get to it. Then it was such a pain to put them all back on, so I would just leave them piled up somewhere. (Hence, the giant mess.) I currently have them in a large craft tote under the ladder shelves. I'm looking for ideas on how to store ribbon, if you have any! 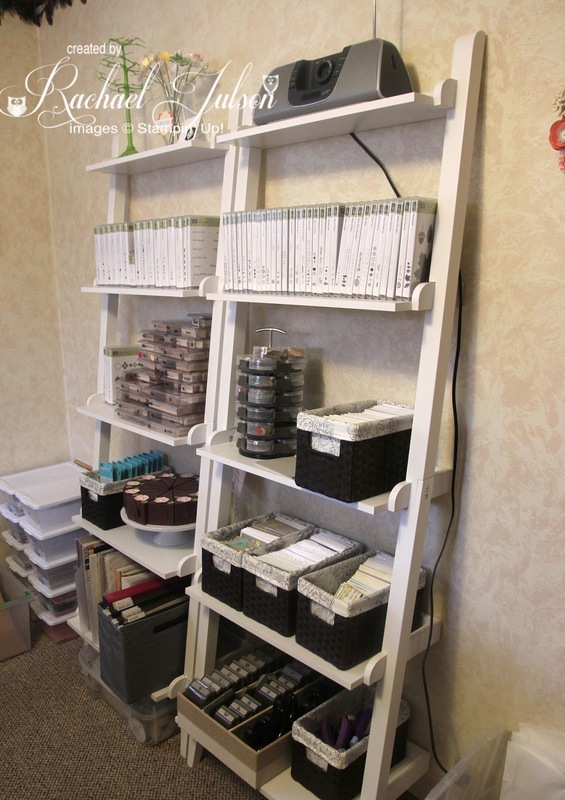 All my Cricut cartridges are on a shelving unit on the wall. In celebration of my newly organized space, I am giving away a stamp set from my stash of retired items. Head on over to my Facebook page to see how you can win!